This is in our opinion a ‘must read’ for all Porsche enthusiasts and anybody who loves Endurance Racing. It is wonderful read with 208 pages crammed full of fantastic historic archive photography. The title pays homage to the sixteen wins that Porsche has achieved at The Le Mans 24 hours, all of which were under the auspices of their senior race engineer, Norbert Singer. 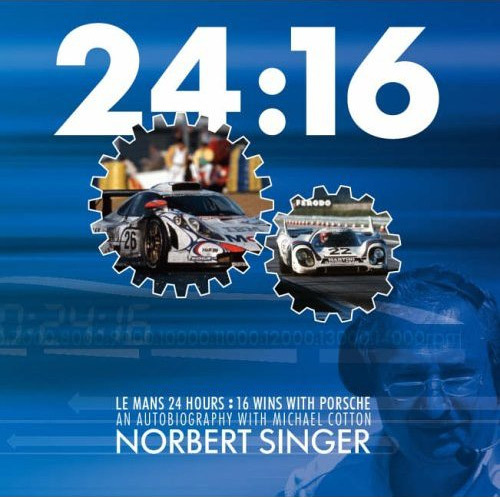 There is a foreword by Derek Bell and tributes from drivers such as Jochen Mass, Jacky Ickx, Hans Stuck, Hurley Haywood, Allan McNish, Stéphane Ortelli, Sascha Maassen, Lucas Luhr, Marc Lieb, all of who won races under Norbert Singer’s management. Singer began his career with Porsche in 1970 sorting out the 917 fuel cell pick-up and gearbox cooling. He finally retired in 2004 when the Porsche 911 GT3 cars were at the peak of their powers. The book discusses all the Le Mans racing Porsches including the 917, 936, 935, 956, 963, WSC Spyder and GT1. It also covers the brutally awesome 1000 bhp plus 917s that raced in Can-Am. With 208 pages and over 280 stunning images the whole thing is beautifully and affectionately put together by Michael Cotton. There is not much Michael doesn’t know about endurance racing and above all Porsches. He has been writing about them since 1967 and was for seven years public relations manager for Porsche Cars Great Britain. Since 1983 Michael has been a highly respected freelance writer but throughout all this time he and Norbert Singer have been good friends and this becomes obvious as you read this fantastic book.